Here’s Balladeer’s Blog’s look at bad movies with a New Year’s Eve theme. As usual, full-length reviews of these films can be found on my Bad Movie page. 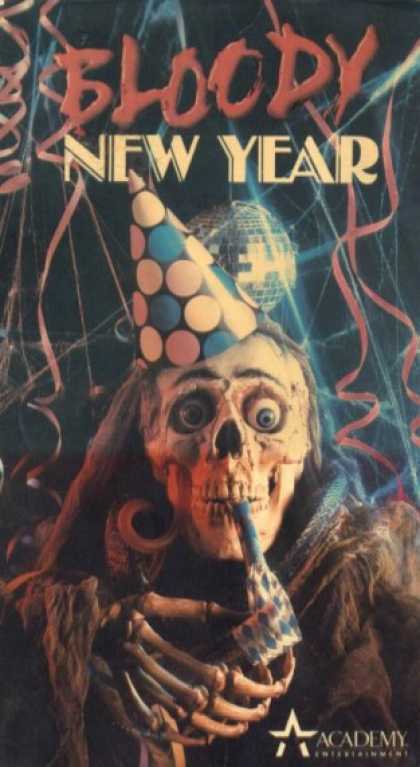 BLOODY NEW YEAR (1987) – Also released under the title Time Warp but it’s grisly enough for the more explicit title. A handful of British boaters who are fleeing a family of soccer hooligans (no, really) wind up on an island with a deserted hotel that’s been decorated for a New Year’s Eve party since the 1950s. This Norman J Warren film stars nobody and borrows heavily from Sam Raimi’s original Evil Dead in terms of its imitation “Deadites” and its POV tracking shots. It also features a killer who emerges from a movie being watched, a monster who climbs out of a tablecloth, homicidal kitchen utensils, indoor snowfall, laughing shrubbery and living walls. All the chaos is being caused by hapless souls who have been trapped in limbo for decades and will do anything to get out or to drag others into their hellish undead existence with them. Here at Balladeer’s Blog I’m very fond of cinematic turkeys that have seasonal tie-ins. In that spirit here’s a look at bad movies with a New Year’s Eve theme. As usual, full-length reviews of these films can be found on my Bad Movie page. This Norman J Warren film stars nobody and borrows heavily from Sam Raimi’s original Evil Dead in terms of its imitation “Deadites” and its POV tracking shots. It also features a killer who emerges from a movie being watched, a monster who climbs out of a tablecloth, homicidal kitchen utensils, indoor snowfall, laughing shrubbery and living walls. All the chaos is being caused by hapless souls who have been trapped in limbo for decades and will do anything to get out or to drag others into their hellish undead existence with them. GHOSTKEEPER (1981) – One of those infamous Canadian tax shelter movies of the early 1980s, so you know what you’re in for: the usual slapdash storytelling, low production values and a tale that would have been better handled in the old glory days of radio decades ago.